This afternoon’s episode of Hello GoodBye will feature live music from Flamingods and Sephine Llo. the band seeks to create both vivid and vague scenes inspired by foreign cultures from different ages and to take influence from wherever they can find it. The music is equally influenced by the various instruments they collect while travelling. The sound of ukeleles, zithers, xylophones, Taishõgotos, keyboards and more are fed through effects pedals and Roland SPs in their attempt to inspire images of other worlds. Originally started as a solo bedroom project of Kamal Rasool’s in late 2009, Flamingods eventually became a five piece multi-instrumental experimental band in order to take their bedroom-recorded releases to the stage. Growing up as expats in the Persian Gulf to shape their outlook on life and music. Flamingods’ inception starts with Kamal Rasool and his family’s appreciation and firmness of the importance of travel. Kamal found himself inspired to start experimenting with music after spending time with indigenous tribe in the Amazon and realising a lack in formal training in music does not mean a lack of energy, creativity and the ability to create rich, scenic music. The band’s most recent release ‘Sun’ is available now through Art Is Hard Records. Sephine Llo is a prolific wunderkind whose accelerated development in the traditional classical music circuit led to early adventures in composition and sound recording. Feeling “strangely unfulfilled” by her virtuosic capabilities, Sephine soon began experimenting with alternative sound sources for her recordings – this included both day-to-day objects and lesser-known instruments such as the kora and sanxian, which she taught herself. She combined this experimentation with an unconventional songwriting style and a unique vocal performance, and hence it’s not surprising to hear whispers of “Kate Bush” and “Joni Mitchell” as references from early adopters. Her debut EP ‘Flame‘ has just been released on Tape Club Records. 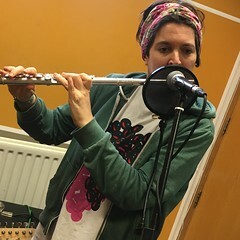 Tune in on 104.4 FM in Central London or on-line via Resonance FM between noon and 1.30pm (GMT). This entry was posted in dexter bentley, hello goodbye show, Hello GoodBye Show: Listings Info, resonance fm and tagged dexter bentley, flamingods, hello goodbye, resonance fm, sephine llo. Bookmark the permalink.